Roof installation and repair do not come cheap. Homeowners should have an estimate of the roofing costs to be incurred before undertaking any work. Blindly going ahead could result to overshooting the budget and spending more than what was originally planned. Under these circumstances, roofing cost calculators come in handy. They will give you an idea on how much you will spend for your roof repair or installation and prepare you for the coming expenses on materials and labor. This way, you are sure to have the kind of roof that you want without scrimping later on materials and design because you underestimated the expense. 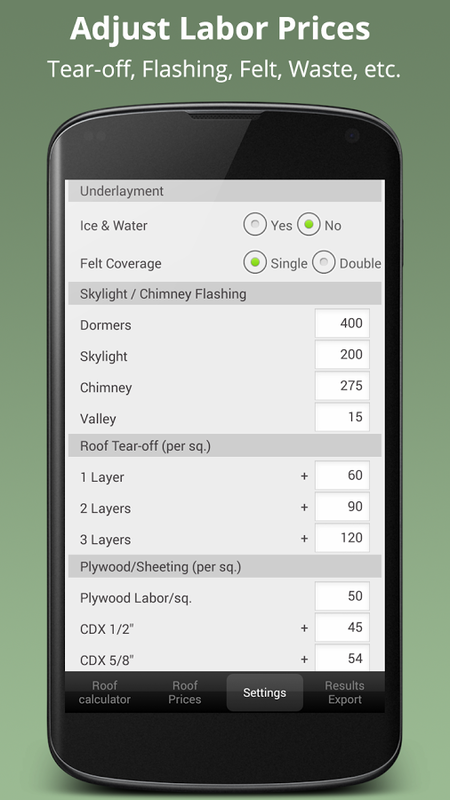 To help roofers and homeowners with the planning, we listed some of the widely-used roof calculator apps today. This is not a free app and can be used only by contractors. The app’s functionality, however, is impressive. The user can input practically all details about the roof including skylight flashings, chimney, tear off, type of installed membrane, number of floors and type of shingles. The app will give out detailed info on material costs and total costs. A great app that accurately measures the pitch of your roof. You only have to use a camera and the accelerometer in your phone to come up with the result. For those who are not inclined to climb up the ladder and step on the roof, this is an ideal app. To get more accurate measurement of your roof’s slope, place your phone with the app on top of shingles or a sloped rafter. This is a very easy-to-use app. The user need only put in data such as kind of material, roof pitch and roof dimensions and the app will flash a price on the screen. Gosu is a Korean word for a highly skilled individual. It can refer to professionals in the construction industry, video gaming and other fields. A free app that can be used by both contractors and homeowners. It estimates the roof area and costs based on information supplied by the user. The user can input the roof slope, shingles type, and ground dimensions, which will be used by the app to come up with the results. Aside from coming up with information on the size of the roof, the app will also give 3 price quotes for the roof materials.